There is something very wrong with Newton’s public school curriculum. The upscale Boston suburb is becoming ground zero in the insidious effort to Islamize and indoctrinate high school students to despise Israel, America and the West. And it’s all being funded by taxpayer dollars. For several years, concerned parents and local residents have complained about the anti-Israel, pro-Palestinian propaganda being peddled to students in both the 9th grade and 10th grade World History classes. Newton educators were given classroom materials promoted by the Outreach Center at Harvard University’s Center for Middle Eastern Studies. In particular, the Outreach Center relies on fringe anti-Semitic websites that claim Jews control the U.S. government, Wall Street and Hollywood. Moreover, the Outreach Center argues that Israel is an Apartheid state founded upon mass murder and the occupation of Palestinian land. The Palestinians, however, are regularly portrayed as peace-loving victims of “Israeli aggression.” Yasser Arafat, Mahmoud Abbas, Hamas—all of these Palestinian terrorist butchers are seen as dovish peaceniks, whose struggle for Palestinian independence has been thwarted by so-called “Zionist colonialists.” In this fantasy scenario, the Jews are evil occupiers, while the Palestinians are an innocent, repressed minority. It’s bad enough Newton students are being subjected to this propaganda posing as “education.” But Newton South High School actually invited Noam Chomsky to address students on the crisis in the Middle East. This is akin to having Joseph Goebbels deliver a lecture on Nazi Germany. Chomsky is a radical anti-American leftist, who believes Israel should never have been created. 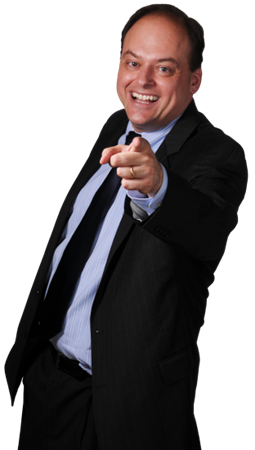 He is a staunch backer of Hezbollah and a rabid fan of its leader, Hassan Nasrallah. Think about it: Newton allowed an open supporter of a Shiite terrorist group, which is responsible for the 1983 massacre of 241 U.S. Marines in Lebanon and the countless murders of Jewish civilians in Israel and around the world, to speak to its 14- and 15-year-old students. Also, videos have been shown claiming Jesus was a “Palestinian” Christ. There are two major sources for Newton’s school curriculum on Islam. One is the Arab World Studies Notebook (recommended by the Harvard Outreach Center); the other is A Muslim Primer. Both are shoddy, sloppy and mendacious academic works that deal in fiction, not truth. For example, students are taught—get ready for it—that Islam has increased the rights of women and minorities across the region. Moreover, students are told that Islam is a religion of peace, and that Jihad has nothing to do with physical violence or military struggle. Rather, it is simply a call for moral “resistance” against sin and personal depravity. This is not just patently false. It is a pernicious myth. From its inception, militant Islam has been an expansionist faith. Its founder, Prophet Muhammad, was a warrior, who led numerous military campaigns against non-Muslim tribes and groups. His Holy Warriors engaged in religious and ethnic cleansing, slaughtering countless civilians—including women and children. A prominent Jewish tribe was massacred, even after surrendering. Muhammad’s goal: to establish Islam’s dominance on the Arabian Peninsula in order to eventually erect a global caliphate. The Koran itself openly champions the expulsion, murder or subjugation of Jews and Christians. This is why for centuries Islam has been spread by the sword, as conquering Muslim armies swept through the Middle East, Africa and into the heart of Europe. To claim otherwise is politically correct nonsense. As for its treatment of women, the Muslim world is an unrivalled example of misogyny and sexism. Muhammad himself had numerous, multiple wives—including child brides. At its core, the Islamic faith embraces Sharia Law, which considers women second-class citizens. This is why in devout Muslim societies—Iran, Saudi Arabia, Pakistan, Afghanistan, Somalia, Sudan, Gaza—women are compelled to cover themselves with the hijab or the burka. 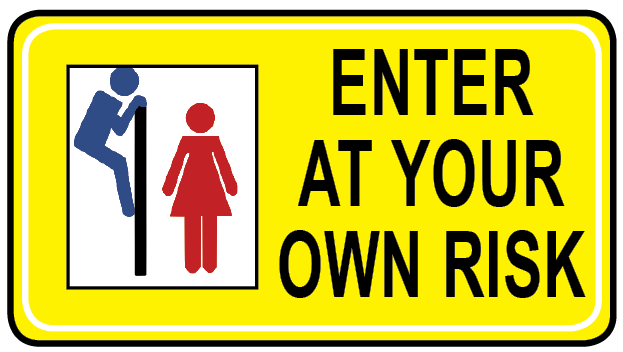 It is a sign of female submission. It is also why honor killings, female genital mutilation and lack of basic civil rights (such as voting) are rampant across the Middle East and North Africa. Yet, to point this out undercuts the prevailing ideology of today’s liberal education system: multiculturalism. The reason why Newton educators are determined to brainwash their students about Islam is that the truth would expose the big lie that all cultures and all faiths are equal. They are not. Islamic fundamentalism remains trapped in the medieval barbarism of the 7th century. Newton’s public schools belong to its parents and taxpayers. When residents, however, demand to know the curriculum materials educators plan to teach to their kids about Islam or the Israeli-Palestinian conflict, they are told it is none of their business. On the contrary, it is precisely their business. It’s their school, their kids and their money that pays the salaries of the teachers and administrators. Which begs the question: What are they hiding? The answer is simple: The growing Islamization and indoctrination of Newton’s students. This is a scandal of the highest order. Anti-Semitism, anti-Americanism and the whitewashing of Islamic terrorism has no place in our public schools. Newton has not become the West Bank or Gaza—at least, not yet. Hence, senior Newton school officials need to be held accountable. 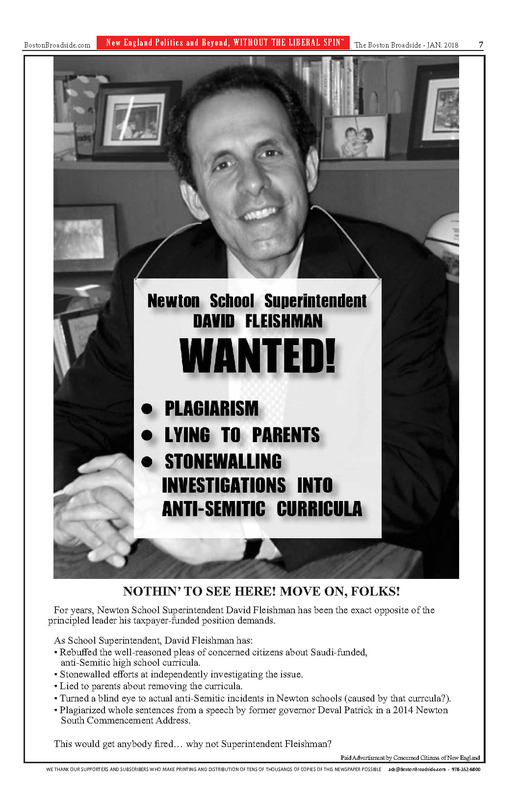 David Fleishman, Newton’s school superintendent, must be fired. Ruth Goldman, chairperson of the Newton School Committee, has shown herself to be utterly incompetent. She should step down immediately. The parents and residents of Newton must demand full transparency in what is being taught in their schools. Their children’s minds are being polluted with Islamist propaganda and Jew-hatred. Where is Newton Mayor Ruthanne Fuller? Strange when considering the demographics of Newton. Would Armenian-Americans in Watertown falsely teach that Turkey was kind to Armenia? Would a school in an Irish-American area falsely teach that the British were kind to Ireland? Instead of this bizarre behavior, Newton should show all how liberal it is by building more low income and diverse housing projects in Newton. Previous post Kuhner’s Corner: Americans are Dreamers too Who cries for Colts linebacker killed by illegal alien drunk driver?